When I was pregnant with Cora, Robert asked if an eternity ring was something I’d like. To be honest I didn’t know what an eternity ring was before then, but I liked the idea of one [sans diamonds. My engagement ring has more than enough diamonds for me]. Five years ago when Robert and I were organising our wedding, I had the idea of having a flat-top ring as my wedding band. I really like strong contrasts and I liked the idea of having a flat-top ring next to the engagement ring that Robert chose for me*. 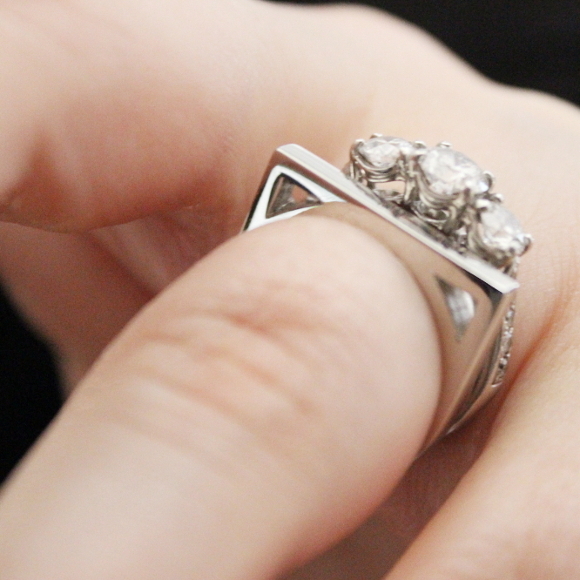 At the time we were on a tight budget, so it was an easy decision to go with a traditional wedding band. But I still thought about that ring. And in the five years since we got married, I thought about it often. Once Cora was a few months old, I started thinking about an eternity ring and my flat-top wedding band came to mind. As I was sketching its general shape, I noticed that if I turned the drawing one direction, it looked like the letter ‘C’. I turned it again, and it looked like an ‘R’. 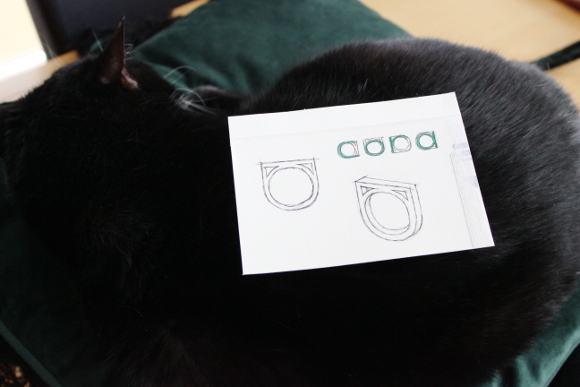 Then depending on which way you turned the ring, it would spell out Cora’s name. I had the perfect shape in mind, but I knew it wasn’t finished. In April I had a stronger idea and began sketching a new design [I remember it being April because I drew on the back of an After Eight easter egg box]. 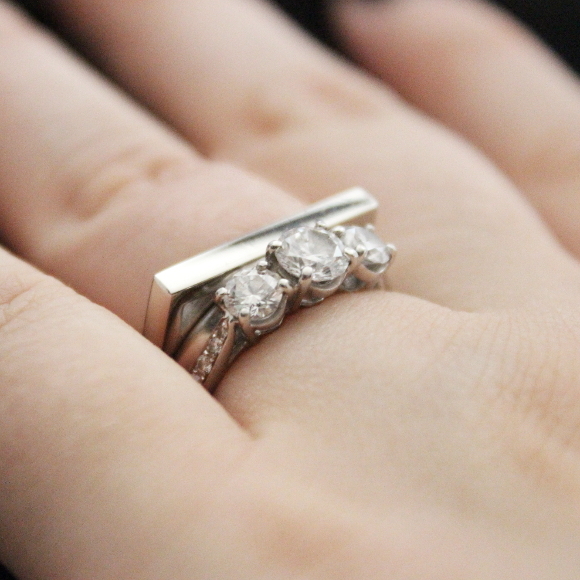 To loosely mirror the gallery look of my engagement ring, I thought about removing the inside corners of the eternity ring [I don’t know if that makes sense. My sketches below will help]. When I did this, the ‘Cora’ aspect of my design was so ridiculously strong that my heart jumped and I knew this was the design I wanted. 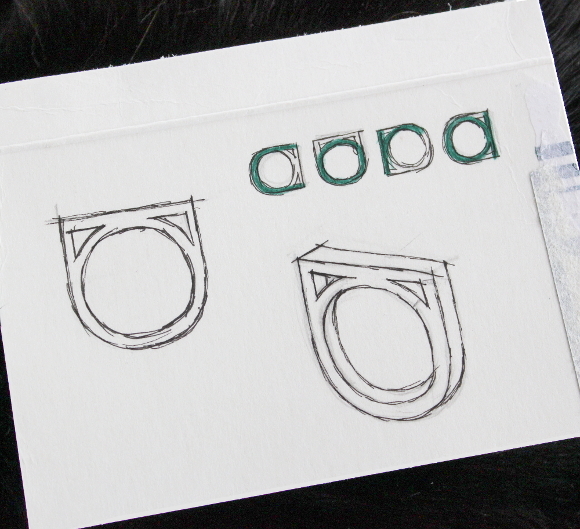 I drew the ring in four different directions for each letter in Cora’s name, marked each letter in green pen and showed Robert – “Cora“. I went to a jeweler in town and asked about getting a bespoke ring made. They didn’t have such a service, but they pointed me in the direction of Da Capo Goldsmiths. 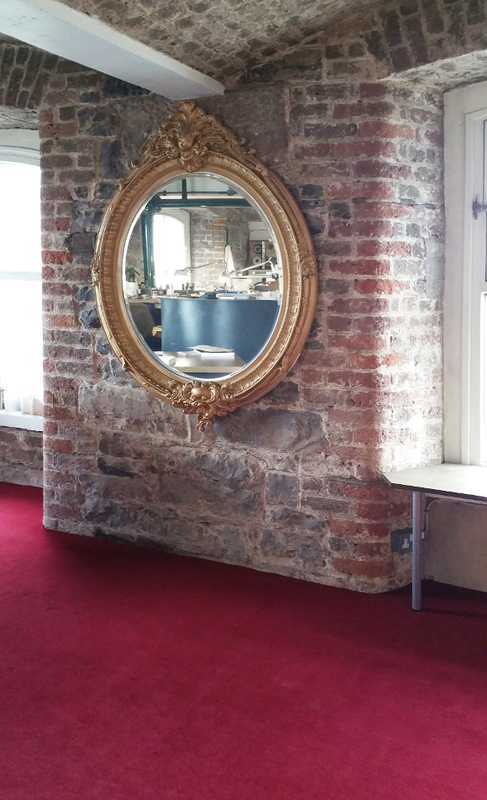 I emailed Sé and a few days later I had an appointment in their studio. Sé [pronounced ‘Shay‘] and I talked for over an hour about the design. He showed me countless pieces he made that were full of secret messages and perfect details that only the wearer knows. Sé immediately understood what I was looking for and I knew my idea was in more than capable hands. A few weeks later Sé sent some 3D designs including 2 alternative designs. I ended up deciding on my original design and of course felt so guilty because Sé’s designs were really beautiful. As Sé explained, by having a choice between designs I can me more sure about what I want. Do you know how difficult it is to photograph your own hand? It’s about as elegant as trying to photograph a string of burst sausages. A few weeks later my eternity ring was ready and I haven’t stopped looking at it since. 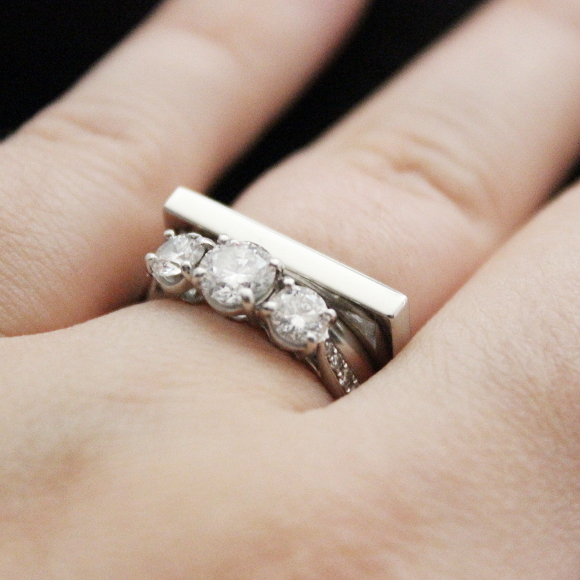 I love the juxtaposition between my engagement ring, my wedding band and my eternity ring. They’re a collection of different styles from different parts of my life and I love how they all make the other stand out. Thank you again, Sé for your talent, creativity and for making the ring I’ve been dreaming about for 5 years into a real thing. If you’re thinking of having anything bespoke made, I would strongly suggest you contact Sé and Lee. They are jewelry wizards. p.s. I should also thank sleepy Toshi for being my perfect backdrop model. 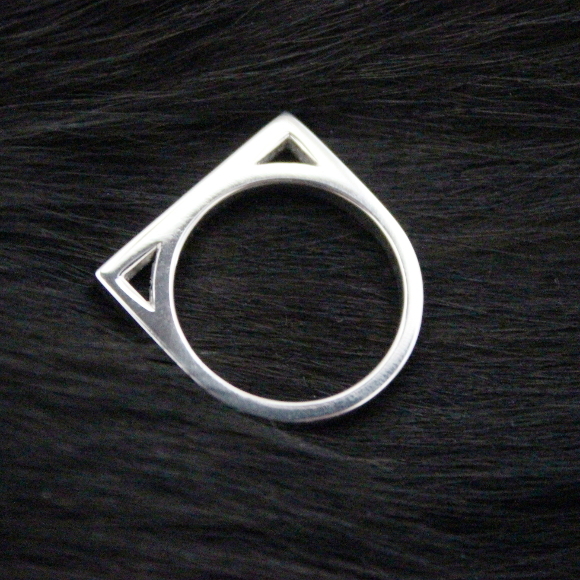 Also, my new ring looks a little like it has cat ears and I am 9,000% okay with that. *Robert spent 2 weeks worth of lunch breaks going from one jewelry store to another comparing engagemetn rings and looking for the ‘perfect one’. He’d often spend his entire lunch hour looking and not have time to eat a lunch. He’d then come home starving, I’d be in the middle of making dinner and he would want a sandwich. “I’m making dinner, can you just wait 20 minutes?” I’d say, and he never told me why he was hungry. Don’t worry, the guilt still haunts me. I don't know how successful I'd be TBH. One piece every 5 years? The overheads would be phenomenal. This is really gorgeous – I love it! So amazing that it is completely unique and bespoke, and your design pictures are so good. 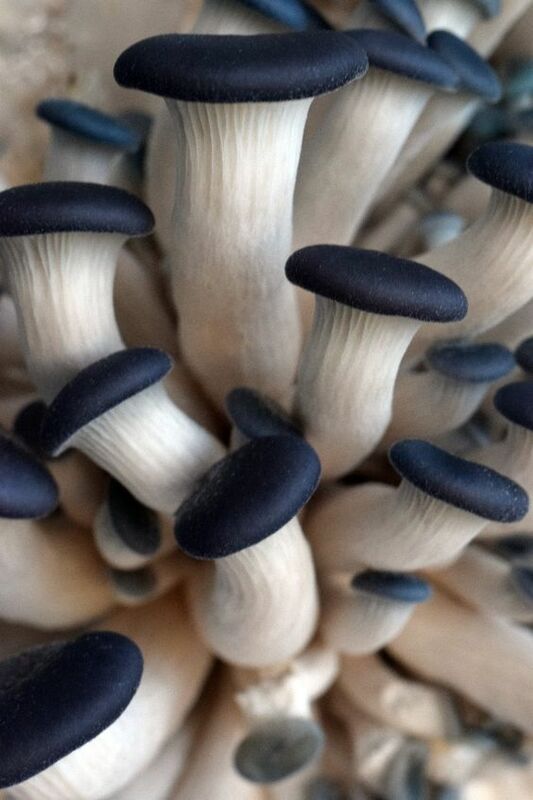 The little secret 'Cora' is so cool. I'm looking forward to seeing this in real life on Friday!!! The only reason I still fit into them is because I never took them off when I was pregnant! And I shot my hands from an angle that cleverly hides the sausage-factor.